This summer I was given the opportunity to minister with Sisters Marilyn Minter and Inga Borko in Jacmel, Haiti. I arrived on June 18th and reluctantly left on July 19th. When I shared the news that I would be visiting Haiti, people did not hesitate to begin asking what they could do to help. I received donations of peanut butter, thermometers, Tylenol, vitamins and other needed supplies. However, since one of the ministries I offered during my visit was a dance class for the older girls, I also asked for funds to purchase dance clothes. Everyone was so generous I ended up being able to buy the tanks, shorts, sports bras and dance shoes you see in the photo. The ages of the girls I taught ranged from about 10 to 20 years old. We had dance class for one hour every Monday through Thursday. During our first week I taught the basic positions of ballet along with basic movements. Sr. Inga was always there to help me translate and manage the twenty girls who came every day. After a couple of days I was actually able to say each of the five positions in Créole. I could also count from 1 to 8, and I could say "right" and "left". Very important words for a ballet class! The second week of class I taught them a dance I choreographed to "Hello" by Adele. The third week I asked one of the girls to teach a Haitian dance since she has experience, so she was in charge and I got to be a student for a while. Our fourth week was one of rehearsals because after Mass at the convent on Sunday, July 17 they showed off their skills by performing both of the routines they learned in class. It was a big event for them. We even made over one hundred cupcakes for the occasion! I'm so excited they had an opportunity to perform in front of an audience. They enjoyed receiving so much attention, and they definitely deserved it. Another ministry I helped with was arts and crafts in the late mornings. Sometimes the kids would work on puzzles, play with Legos, or enjoy playing some sort of game. 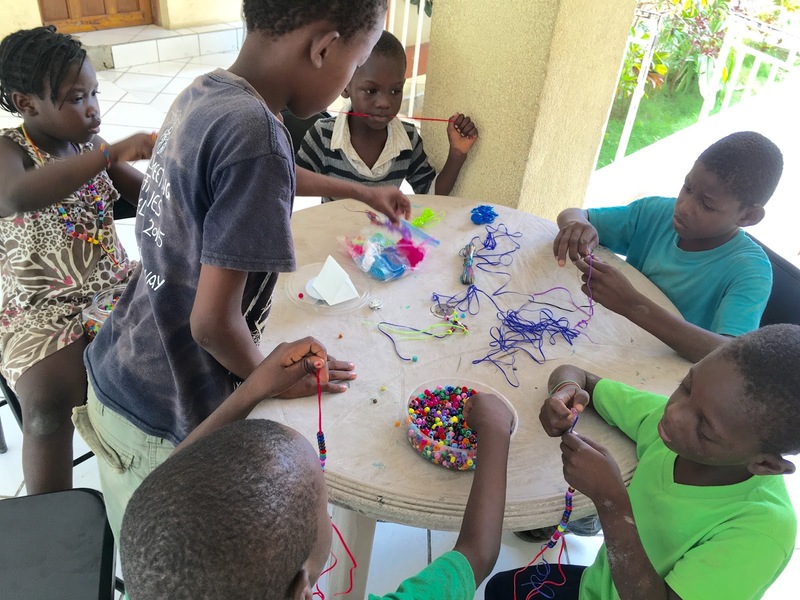 However, both the children and young adults especially enjoyed making beaded bracelets and necklaces. If they could do it every day, they would! This picture is from Friday, July 1st. It was my first trip with the mobile clinic. I was fortunate enough to go on three trips total. 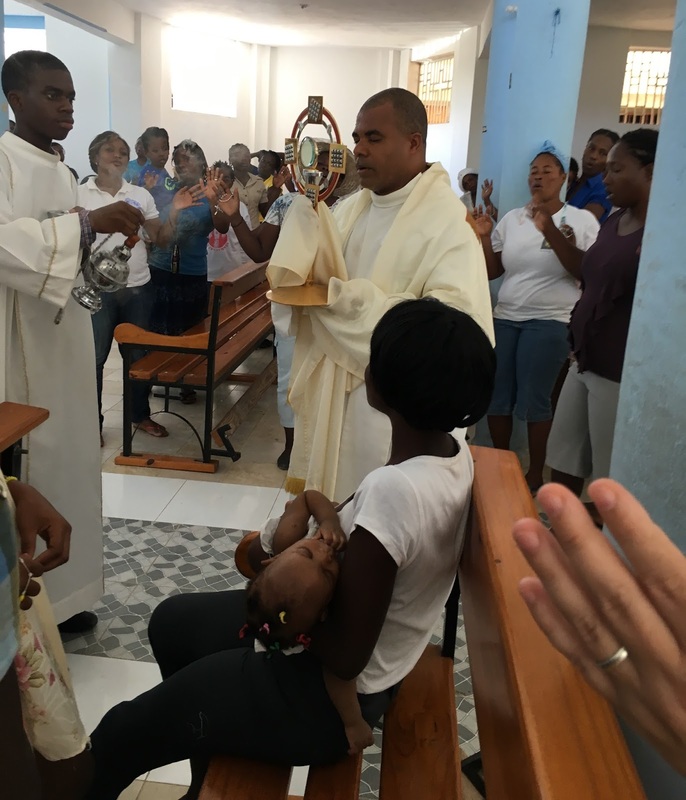 On this particular day, we left at 7:00 a.m. to minister to people at St. Rose of Lima Parish in the village of Decouze. Our team consisted of two Haitian doctors, two Haitian nurses, one Haitian pharmacist, a Haitian driver, and two Haitian wannabes (me and Sr. Marilyn). The drive was stunning. It was so beautiful that I didn't even mind feeling like a bobble head during our hour and a half drive up, or our hour and a half drive back down. The roads were unyielding, but the people we ministered to were kind. That day we saw about 115 patients, from several infants to a 93-year-old man. They would check in with one of the nurses first to provide their name and age, and then the nurse would weigh them and send them to one of two doctors. After seeing a doctor, they would come to where I was sitting with the pharmacist and receive whatever medications the doctors prescribed. I helped count out all the pills. I have no idea what we gave them, but I know sometimes it was pain medication, sometimes vitamins, and other times very serious looking stuff. It just made me happy to know that they felt cared for. Monday, July 4th. For the first round we piled all 12 of the kids you see here into one vehicle. It was amazing. The second time around (Tuesday, July 5th) we added one more, so we had 13 kids in addition to the three of us. Beach day was another one of my favorite days because the joy bursting from every seam of these kids made me feel so alive. Even the cramped car ride was a blast. They sang songs at the top of their lungs and I joined in when a Mass song cropped up every now and then. While at the beach I splashed around with them a little, but I mostly loved watching them chase the beach ball and each other. They would roll around in the shallow waters on the shore and yell "Gade, gade!" ("Watch, watch!") and they'd show us how brave they were by submerging their faces underneath. On Saturday, July 9th the Sisters organized a Divine Mercy pilgrimage. We took the young adults from our catechesis class. They had special scarves to wear with the icon of the Year of Mercy, and they happily tied them around their necks or on their heads. The day included a drive to the Immaculate Conception church in Zoranje where they received a mini lesson by one of the seminarians on the Chaplet of Divine Mercy. After that, Madam Omanie led us as we chanted the Divine Mercy Chaplet in Créole. Once we finished, the opportunity to receive the Sacrament of Reconciliation was available. Following confessions, we had adoration of the Blessed Sacrament, then we celebrated Mass together and concluded the day by walking through the Doors of Mercy two at a time. Before heading home everyone enjoyed a nice peanut butter and jelly snack. visit with the children in their homes. They knew we were coming and they were so excited, they came to our place first so they could accompany us. They giddily and proudly showed off their simple homes, and we chatted with plenty of their family members and friends. It's a good thing I've been practicing and learning Créole! Another great blessing during my time in Haiti was the community life. We celebrated Mass together (in Créole) every day. We prayed together twice daily, as is our Felician custom, and we had adoration of the Blessed Sacrament every day as well. On Sundays we had faith sharing, which is one of my absolute favorite ways to pray, and afterward we had movie night. We'd make our way to the kitchen from chapel and Sr. Marilyn would start the popcorn while Sr. Inga and I set up the laptop and projector. One night we watched a movie called "Hidden in Silence", which was about a young Catholic woman who hid several Jewish friends and acquaintances in her home during World War II. One Sunday we watched a movie on Mother Teresa called "The Letters" and on another night we enjoyed "Despicable Me 2". We found time one Sunday to go to the pool and swim for a couple of hours, but I also enjoyed the community life that wasn't recreation. I liked the quick grocery shopping trips, discussions on ministry matters, and last-minute schedule changes, along with the fact that we did almost everything together. These were just a few of the moments I enjoyed, but over a period of a month I enjoyed many more, and was challenged by countless others. At first, one of my biggest struggles was not being able to talk with anyone outside of the convent. By the end of my trip I could laugh with the kids and make silly jokes with my simple ways of communicating. I also had to adjust to a whole new culture. I didn't realize that I had glorified the idea of learning about other cultures until I was immersed in one other than my own. I thought everything would be perfect, like falling in love for the first time. It was, but then I also had to learn to embrace the imperfect aspects of my new love interest. I learned not to create my own idea of who someone should be, but to let them show me who they were so I could love them with sincerity. I also adjusted to the heat, cold showers, dusty feet, and children pulling on every one of my limbs. I sure am going to miss the Sisters, the children, the scenery, and the food.